“Maalaala Mo Kaya” (MMK) is continuing this coming Saturday its questionable practice of featuring the life story of political figures who are involved, directly or indirectly, in an upcoming election. The said drama anthology series will feature the life story of Senate President Juan Ponce Enrile for its April 27 and May 4 episode. Hunk actor Enrique Gil will play Enrile during his early life in the two-part episode directed by Nuel Crisostomo Naval. In a press release, ABS-CBN noted that this is “Primetime Prince” Enrique Gil’s first starring role in an MMK episode. The April 27 episode will cover Enrile’s life as an abandoned son (he was born Juanito Furagannan) who struggled with extreme poverty and as a guerrilla fighter during World War II. Also starring in this episode are Malou de Guzman, Bugoy Cariño, Bernard Palanca, Paco Evangelista, Ya Chang, Helga Krapf, BJ Forbes, Josef Elizalde, Marx Topacio, Efren Reyes Jr., Alicia Alonzo, Bodjie Pascua, Rochelle Barrameda, Ian Galliguez, Simon Ibarra, Joe Gruta, Jong Cuenco, Almira Muhlach, and Jessica Connelly. Enrile has been a national political figure since the late 1960s. 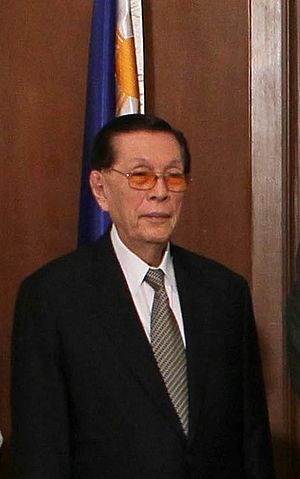 At age 89, Enrile has held different positions in both the executive and legislative branches of government. Lately however, the Senate President has earned flak for publishing an autobiography that many deemed whitewashes his role during Martial Law. His highly-publicized tiff with Senators Alan Cayetano, Miriam Santiago, and Antonio Trillanes early this year over alleged misuse of Senate funds also put him in a negative light. Nevertheless, these developments haven’t stopped Enrile from fielding his son Jack (who currently serves as a congressman from Cagayan) in the May 2013 senatorial race. If surveys are to be believed, the younger Enrile has a chance of making it to the senate, albeit barely. For this election cycle, MMK has shown the life story of Grace Poe and Alan Cayetano, who are both running under the administration ticket. Once the campaign period for national candidates kicked in, doing this already became illegal. According to Article 6.7 of Republic Act 9006 or the Fair Elections Act, the portrayal of the life or biography of a candidate in a theater, television station, or any public forum during the campaign period is prohibited. Did Enrile ask the people behind MMK to feature his life story, or is it the other way around? Did Manong Johnny actually write a letter for Charo Santos? Either way, where’s the delicadeza?